I was having one of those days where I was so clueless about how to flavour my chicken then BAM it came to me, Orange Chicken. Then the question of how do I make orange chicken low carb? Well, I figured I would approach it in the simplest manner. 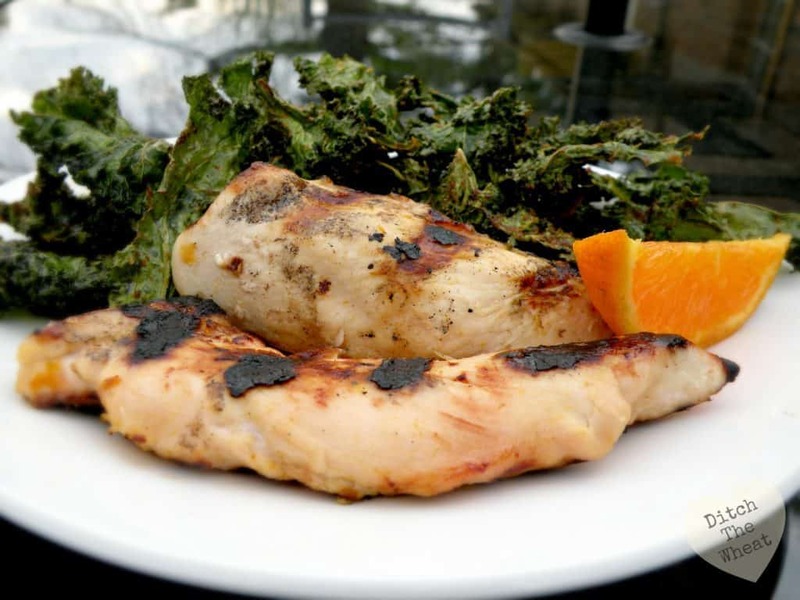 Use a real orange to flavour the chicken and just focus on the flavour, not making an orange sauce. I decided the easiest way to infuse the most orange flavour in my chicken with the least carbs would be to marinate it. Keeping the simple approach in mind, I took a medium orange, cut it open and squeezed the juices out of it. I placed the juice, orange peel, and chicken in a Ziploc bag and I left it in the fridge for hours. 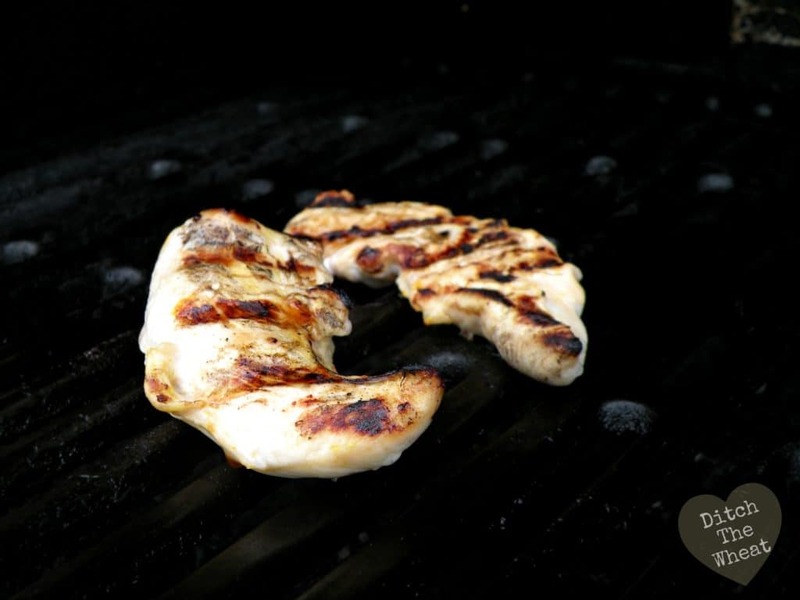 When supper time rolled around I grabbed my marinated chicken and grilled it on the bbq. I did consider putting additional spices on the chicken to enhance the orange flavour but I decided to forgo it. The result; was chicken that has a nice light orange flavour. To add more flavour I squeezed fresh orange juice over the chicken before eating it. 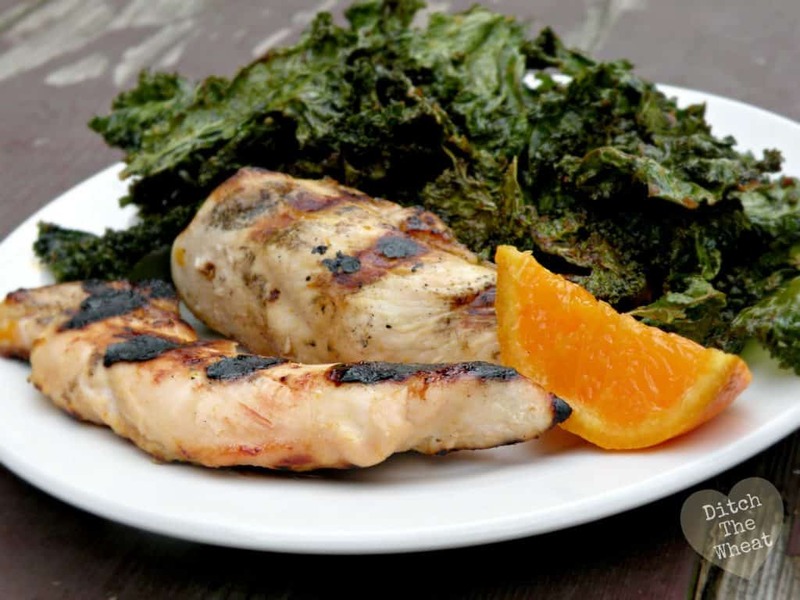 Such a wonderful, simple dinner, which I served with All Dressed Flavoured Kale Chips (recipe to follow next post). Squeeze as much juice out of 1 half of the orange. Put the orange juice, orange peel (optional), and chicken in container to marinade. Leave the ingredients to marinate in the fridge for a couple of hours. After the chicken is finished marinating barbeque until the meat is no longer pink inside. Optional ~ Using the other half of the orange, drizzle fresh squeezed orange juice over the chicken. What marinades do you like? LOVE this post. Your photos are gorgeous and what a simple, elegant and delicious recipe!!! 4. Same as #2 but use Lime instead and add, Smoked Paprika, Toasted Cumin and Coriander, ground (about 1/2tsp each). I like yours better though cuz your's has beautiful simplicity in its favor. I've been getting better and better each post at taking pictures. My number one lesson I have learned is to use natural light. I used the deck as the background and took these pictures after I finished work. I also use http://www.picmonkey.com to edit my pictures. Thanks Susie!!! You rock too!